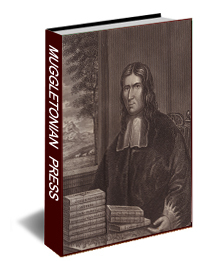 The declaration of the Third Commission by the Muggletonian prophets and their followers generated a great deal of opposition, and in the style of the times this opposition often took the form of polemical pamphlets, often scurrilous in nature. The Muggletonians responded in kind with the flow of argument only subsiding as the Muggletonians withdrew from the public arena following the persecution and finally the death of their prophet. 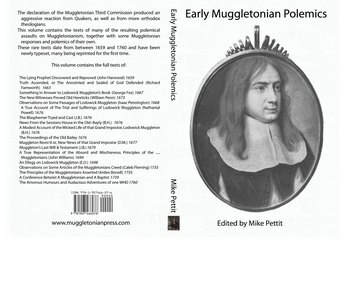 This volume contains the texts of this literature, the prophet Muggleton's polemical works have been republished by the Muggletonian Press in the volume "The Collected Works of Lodowick Muggleton: Quakers, Witches and Acts", this volume containing the anti-Muggletonian works and the responses of lesser Muggletonians. These works are often very rare and are only available with some difficulty, with the originals often being in very poor condition. These problems have resulted in some difficulty in accurately transcribing the original texts, however these problems only magnify the advantages of accessing these newly typeset works. This volume contains: The Lying Prophet Discovered and Reproved (John Harwood) 1659, Truth Ascended, or The Annointed and Sealed of God Defended (Richard Farnworth)1663, Something In Answer to Lodowick Muggleton's Book (George Fox) 1667, The New Witnesses Proved Old Hereticks (William Penn) 1673, Observations on Some Passages of Lodowick Muggleton (Isaac Pennington) 1668, A True Account of The Trial and Sufferings of Lodowick Muggleton (Nathanial Powell) 1676, The Blasphemer Tryed and Cast (J.B.) 1676, News From the Sessions House in the Old-Bayly (B.H.) 1676, A Modest Account of the Wicked Life of that Grand Impostor, Lodowick Muggleton (B.H.) 1676, The Proceedings of the Old Bailey 1676, Muggleton Reviv'd or, New News of that Grand Impostor (D.M.) 1677, Muggleton's Last Will & Testament (J.B.) 1679, A True Representation of the Absurd and Mischievous Principles of the ..... Muggletonians (John Williams) 1694, An Ellegy on Lodowick Muggleton (E.O.) 1698, A New-Year’s Gift For The Ratcliff Convert To Muggletonianism (J Sharpe) 1717, Observations on Some Articles of the Muggletonians Creed (Caleb Fleming) 1735, The Principles of the Muggletonians Asserted (Arden Bonell) 1735, Truth And Reason Defended Against Error And Burning Envy (W Henderson) 1728, A Conference Betwixt A Muggletonian and A Baptist 1739 and The Amorous Humours and Audacious Adventures of one WHD 1760. If anyone wishes to exchange their copy of the previous edition (292 pages) for this expanded revision just send the front cover to us with your name and address and we will send the revised copy for no charge.